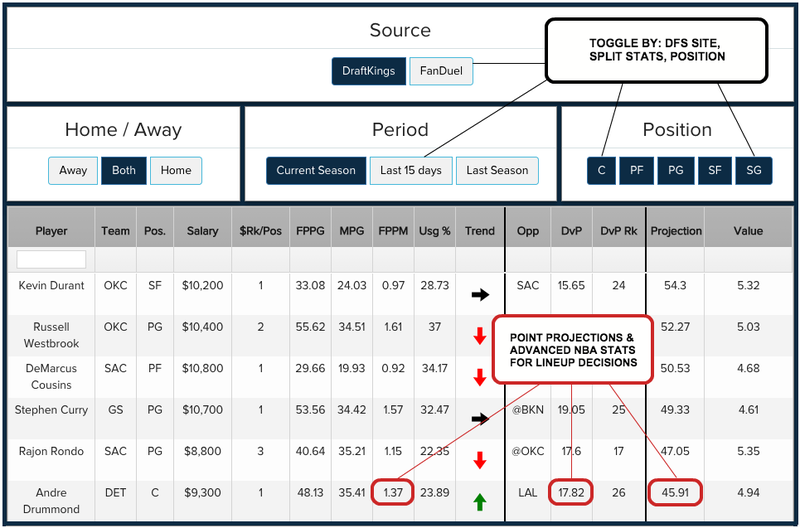 We are proud to offer you our Premium NBA DFS Lineup Analysis Tools for FanDuel and DraftKings. If you play in fantasy basketball DFS leagues, and need some extra analytical juice for your lineup decisions, you have come to the right place. Exclusive access to RotoBaller Premium NBA DFS Lineup Analysis Tools to help you win your head-to-heads and GPPs. You can consider our NBA DFS Lineup Tools steroids for your DFS lineups. 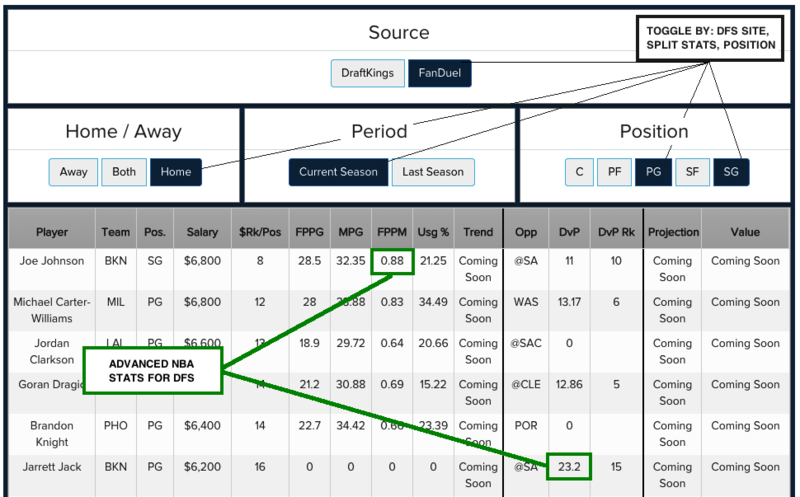 DFS Value Picks Tool: Brand new for 2016, this cutting edge tool will help you find, sort and filter the best value and sleeper picks for each day of NBA DFS action. With premium stats like "Usage Rate", "Trend" and "Value", you will have a serious leg up on the competition. Daily NBA Projections: Meticulously researched daily DFS points projections for FanDuel and DraftKings. Want a Free Month of Premium NBA DFS Tools? Make a deposit in a new FanDuel or DraftKings account, and get one month of Premium access for FREE! Just send an email to info@rotoballer.com with your new FanDuel or DraftKings account, and we'll get you setup. RotoBaller.com is a leading provider of fantasy basketball expertise and daily league advice. Our team of fantasy basketball professionals is here to help you win your games and leagues. We are not responsible for performance or outcomes of your fantasy leagues and contests. All individuals are responsible for making their own lineups decisions.